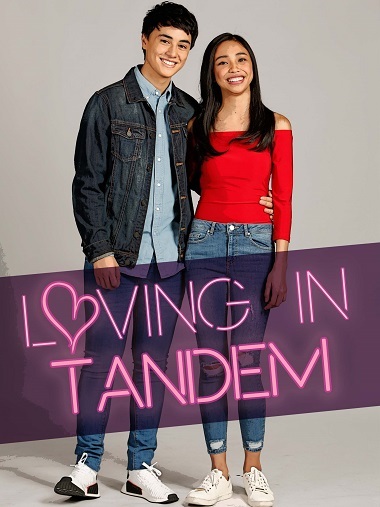 QUEZON CITY, Philippines - Sept. 20, 2017 - PRLog -- From becoming household names as the most interesting personalities to watch inside the most famous house in the Philippines, the Pinoy Big Brother House's last season, Maymay Entrata and Edward Barber take it to the next level as they star in their first movie "Loving in Tandem" airing via TFC@theMovies starting September 21. Once relatively unknown teens with big dreams, Entrata and Barber, more known as MayWard, have won the hearts of viewers with their tongue-in-cheek conversations and natural chemistry. In "Loving in Tandem" MayWard will gear up and bring this magic to the big screen in a film directed by Giselle Andres. In the story, Entrata plays Shine, a strong and independent girl with a big heart. She meets Filipino American Luke when the latter performs a heroic act to which the former falls for. It turns out that Luke is the long lost brother of her neighbor Tope played by fellow PBB alumnus Marco Gallo who is for his part, in love with Shine's friend Jayzel played by Kisses Delavin. And there lies the romance twice the thrill. More than the romantic angle, the movie tries to show that while Shine's life is beyond perfect, she sees the beauty in everything. Meanwhile, Luke may have been blessed with a comfortable life, he finds it hard to see the brighter side of things given his pained past. Together the two will tread a path towards realizing that home is where the heart is, no matter how painful it can to stay at times. Andres, a protégé of Olive M. Lamasan, said that while MayWard and KissMarc are new in the film industry, she admits she also learned from them. "Bago sila, bago ako. Pero ang ganda, sabay-sabay kaming natuto. Mahirap no'ng una, pero nagbibigayan naman po, kaya later on naging mas madali at masaya (We are all new in the business. This turned to our advantage because everything became easier and fun). Both thought that entering the PBB House was the most challenging. However Entrata proved herself wrong --- it was acting for movies. However, she passed with flying colors. "Siguro po, dahil naniwala po ako na walang imposible, kaya go lang ako nang go. Dahil din po siguro sa mga inspirasyon ko sa buhay, kaya nangyayari lahat ng ito (I believed that nothing is impossible so I went for it. I attribute all that is happening to the inspirations in my life", Entrata ends. Barber for his part thought that while it presented a new opportunity for him and his loveteam, it was daunting. "Doing the movie is the scariest thing I did. I've never been more tired, I've never been more nervous, but it is the most satisfying thing I've done in my life". Also playing support were Cacai Bautista, Ryan Bang, Ketchup Eusebio, Xymon 'Onyok' Pineda, Thou Reyes, and Ms. Carmi Martin. Hitch a ride to "Loving in Tandem" screening in the Papua New Guinea and Brunei on September 21; United Kingdom from September 22 until 28; Saipan starting September 22; Italy on September 24; Middle East starting September 28; Hong Kong on October 1 and Singapore on October 8. For more information about the movie, visit the official TFC facebook account in your area. Connect with fellow Kapamilyas and visit @KapamilyaTFC and @KapamilyaPR via IG and Twitter.